In a recent post, I showed off some postcards that a blog reader had sent me with a letter. 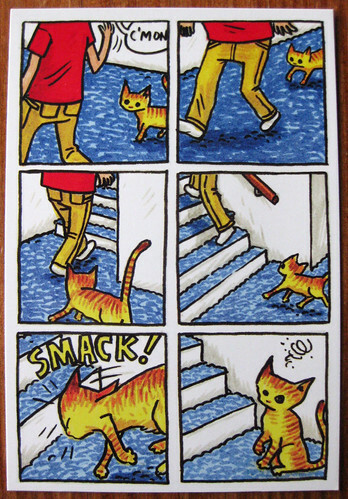 I wrote one, so here you get a closer look at one of the fabulous The Cutest Sneeze in the World: 30 cat postcards by Jeffrey Brown from Chronicle Books. 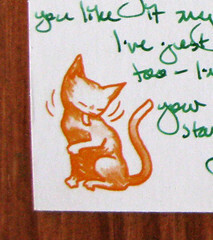 The back of the postcard has this little clean kitty in the bottom left-hand corner, and underneath the area where you are to affix a stamp, it says "lick, lick." Oh I love them and thanks for giving me paper envy again . Like I dont get enough as it is LOL !!! I know I know I am a real piece of work right ? thanks for sharing and posting this . Those are so cute! I may have to get some! And, indeed, I think that is the cutest sneeze!